What the hell, let’s do this tonight: the cover for GOTN is in! I was sent two options, and after showing it to some trusted people I’m going for this one. I’m still at the stage where I can ask my designer to make tweaks before signing off on the final version, so if you have any thoughts feel free to speak up! I wasn’t quite sure about the space ship design to begin with, but given a couple of hours looking at this cover, I’m falling for it. Besides, a designer as good as Dane at www.ebooklaunch.com is almost always right. Authors not getting exactly what’s in their mind’s eye are often a pain in the arse to work with as well. When I scaled this cover down to a thumbnail, as it would be in most ebook stores, I realised why the curved design works so well. Even though I’m taking a day or two to consider one or two minor possible adjustments that might improve it, I’m thrilled with this cover – it’s even better than the Shadow’s Talent one! 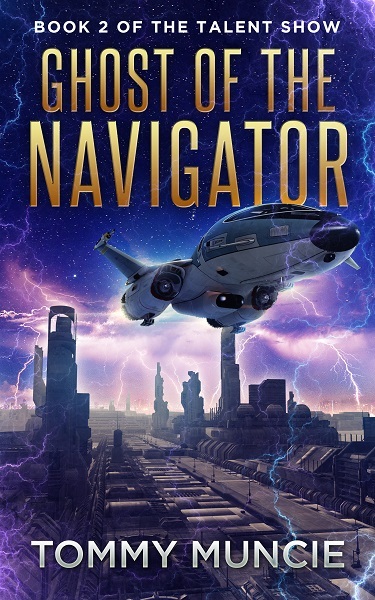 Next Next post: PREVIEW – Read the opening of Ghost of the Navigator here! Hi Tommy, this is how I am following you, and on Twitter. I just got mixed up with the names after the half a shandy I consumed at the wedding that and I have it saved under your name in my RSS reader. The cover looks great to me but I don’t know how well it conveys the story or how you imagined it. I’m currently swamped with a backlog of literally 100 books I want to get through for work and ideally I’d like to refamiliarise myself with Shadows Talent before the sequel. How long before the launch can someone order on Amazon? A friend of mine launched his book and told me if enough people pre-order than on sale you can put “Amazon Best Seller” or Amazon Bestselling Author on future books but I have no idea of how this works or the strength of the competition in your niche. It only has to hold that spot for an hour. I’m thinking of course from a marketing/sales perspective and not of doing something that you love… something I have never known and can’t comprehend!! I’m not going to set pre-order up for this book – it’s a good thing to do if you’re an author with a large fanbase who are hammering on the door for that new title, but that’s not me yet. I’ll happily send you an ARC (Advanced Reader Copy) when it’s ready. If you want to read and write a review before the February launch I should have a serviceable version by Christmas, but keep in mind it won’t have gone through my editor yet. I get what you’re saying about putting ‘Bestseller’ on the cover but I already decided not to do this even if I make those rankings – covers become overcrowded when you start to add more than author, title and ‘extra line’ (in my case that’s the ‘Book 2…’ above the title). Authors who win awards create the same problem when they add them to covers. If I ever change my mind, my designer offers minor cover revisions at a small price. You can get it to say on Amazon on the listing page you it is a bestseller, not sure if it doesn’t that automatically. Still it is a good problem to have, I hope you have numerous awards that and struggle to decide whether or not to put them on the cover… as long as you never get in the Richard and Judy book club, that is one thing to stop me buying any book! If Richard and Judy read Shadow’s Talent and survived then GOTN would finish them off for sure!